Growing up, I hated all tubers: taro, cassava, potato, yam, etc. And since cooked hard squashes have similar texture to cooked tubers, I avoided them as well. Funny how your taste changes over time. I now love all kinds of tubers and root vegetables including all hard squashes. Kabocha or buttercup squash is my top favorite. This particular type of squash has lower moisture content which means its flesh is firmer. Besides, it is the only winter squash that doesn’t have that “squashy” smell, if you know what I mean. This dish is one of the many dishes I was served quite often when I was growing up. I used to get yelled at for picking off the squash and eating only the meat. 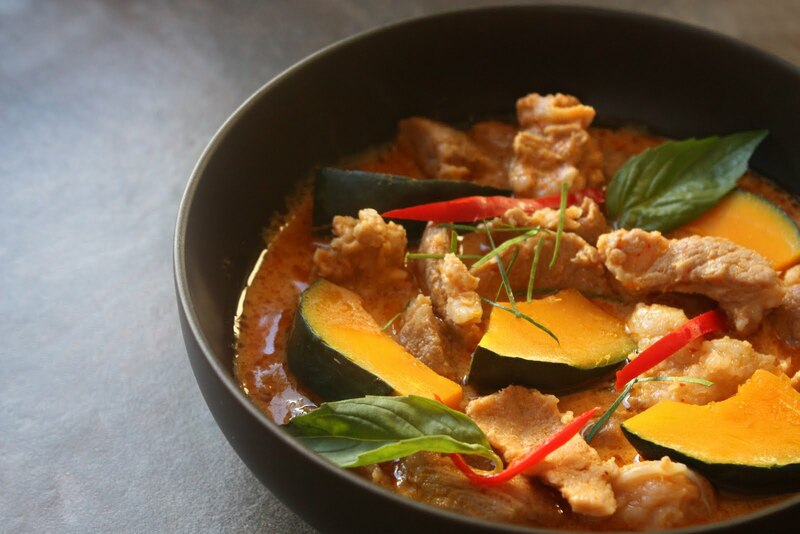 Even then, I knew it was the squash that made the dish more delicious; it imparts subtle natural sweetness to the curry and complements the pork very well. 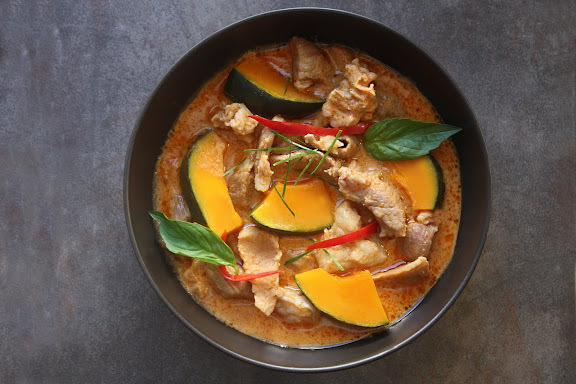 In a saucepan, set over medium-high heat, heat up the coconut “head” (the thick part that rises to the top of the can) along with the curry paste, stirring constantly. Add half of the coconut “tail” (the remaining thin, watery part) and bring the whole thing to a boil. Season with fish sauce and sugar to taste (personally, I don’t add sugar as I think the squash adds enough sweetness to the dish). Stir in the basil leaves and and kaffir lime leaves, and take the pot off the heat immediately. Serve warm with steamed Jasmine rice. Oh, this looks like a great idea for the squash I am currently collecting in my kitchen. Could I also ask for the Thai Pumpkin Custard recipe that was mentionned in the post, since I am cursed with the Sweet Tooth but do not like pumpkin pie… Thanks in advance! I will try this, is it supposed to be dry as in photo, no sauce? Anonymous – Actually, no. It’s supposed quite “saucy.” It’s just that pieces of pork and tender chunks of squash covered in brown-orange sauce don’t make for a very appealing food photograph. This is a problem I face all the time when photographing Thai curries. I had to add all of the coconut milk and even water as I didn’t have any sauce. Maybe I did something wrong? Were the lime leaves a garnish? Anon – Yeah, sometimes you’ve got to play by ear. The amounts of canned coconut milk fat vary greatly from brand to brand, and can to can. The fat that solidifies or concentrates at the top of the can can be anything from 1/2 cup to 3/4 cup. All of that evaporates during the initial stage when you fry it with the curry paste. So the more you scoop out in the beginning, the less liquid you have left. The size, width, and depth of the pan that we both use may be different, and all of those factor play a part in how much liquid evaporates during the cooking process. You did the right thing by adding more liquid as you thought appropriate. The kaffir lime leaves are supposed to be added to the curry at the last stage along with the basil leaves. I didn’t realize I left that out until you brought it up. It’s fixed now. Thank you. Delicious! It was a hit, served 4 (2 guys, 2 girls with plenty of rice) with a little left over. I added half of a red bell pepper sliced into strips, and a little garlic and onion. It tasted a lot like my favorite curry dish at my favorite thai restaurant! Thank you for this recipe Leela! I have learned the difference between the squashes, and I have a kabocha squash ready. I’ve always wanted to know how to make this from scratch! thanks for the post. For the curry paste, is that 2 ounces by weight or by volume? Thanks in advance!